That's a page from Among Others. It's my book. It's underlined. Confession time: I write in my books. I correct typos. I take notes. I underline, star, bracket, and otherwise mark up the pages of my most-loved books. Galleys, hardcovers, used books, anything. Well, obviously not borrowed books, whether it be from the library or another reader. That's just plain rude. Half of you will probably stop reading at this point. That or start steaming out the ears. Any booklover can tell you that writing in books is a polarizing topic. It's like Catcher in the Rye and Miracle Whip: love it or hate it. Do it or disdain those who do. I'd argue, though, that my notes and marginalia are a sign of love. The more I like a book, the more marks it carries. Each mark is a passage I want to remember, a sentence I want to quote, an idea I want to revisit. Books are meant to be opened, read, shared, thought about and commented on. Why not start with the pages themselves? I mentioned this habit in passing to a co-worker and friend when he offered to lend me a book, and I replied that I preferred to purchase my own copy so I could take notes in it as I read. I was met with an incredulous stare. "You write in your books?" It was more than incredulous. It was outraged. Polarization in action. Naturally I took the question to Twitter, where responses varied from "Yes, absolutely!" to "Only my textbooks and reading for a class or work" to "It's the most annoying thing about a used book to me, to find comments from past readers in the margins." So now I pose the question to you: Love it or hate it? Notes or no notes? Underlines or highlighter? Pen or pencil? I loved that passage from Among Others too. And I also write/underline passages/add marginalia to my books. Always in pencil, though. what's the point of reading, if not to react to the books we're reading? when i was younger i never wrote in my books, but i fortunately grew out of that and now have a hard time understanding why anyone WOULDN'T write in their books. Nymeth - Isn't it excellent? It so captures the escape that reading provies. Interesting that you only write in pencil. I write in whatever utensil I can find, though only with a fine tip, as otherwise it just becomes blurry and messy. Ellen - Exactly my point! I went through a phase where I wanted all of my books to be pristine, but like you, luckily I grew out of it. Now it proves my favorite part of revisiting the books I've read; each marking is a kind of journal entry, and I can see the difference in what I marked then and what I mark now. Thanks for sharing the NY Times article. I hadn't seen it. I think it's correct, that we are infected with the idea that this is a bad habit - maybe it comes from the shared books we read in elementary school? I remember an episode of Wishbone in which they scolded a child for dog-earing pages. Sad to see it going out of style, though. The marginalia is often my favorite part of picking up a used book. That goes for inscriptions, too. It's a little piece of history in your hands. I don't do it very often, but I love to hear that others do it. I agree that it's a great way to interact with a book, and it shows your history with the book. *gasp* never! I used to mark up my books but then I discovered I could never read that book again with any kind of neutrality because my eye was always drawn to and distracted by the underlines and notes. I compromise now by using those little removable copper 'darts' and then making notes in a separate notebook or on my blog. I do agree, though, that a book should be loved hard in whatever way the reader likes best. Mine are usually dog-eared and warped by the time I done with them, just not written in. Except cookbooks. I do write in my cookbooks with my own adjustments to the recipes, but that's pretty much it. I feel like I'm intruding now when I say I don't really write in my books. At least not the ones I read for pleasure. My general reading fare is high fantasy and science fiction, so unless it's a really interesting plot with crazy moral twists and whatnot (I'm looking at you Robert Jordan and WoT), I don't often see much to comment on. It's not because I feel like I'm defacing the book. Trust me, I doggie-ear the hell out of my pages, chuck the books across the room only to have them spectacularly fail to hit the bed, get accidentally crumpled in the bottom of my bookbag. My books are well-loved, judging by the rapidly disintegrating glue on the spine of my copy of Eye of the World. No, I don't write in my books because I don't want to be interrupted. Interruptions drive me insane (you should have seen me trying to devour The Deathly Hallows the day it came out while my parents were throwing a party. My mom asking me to run an errand for her? I brought the book and read in the car). I do mark up the books I'm studying, like the Harvard Classics book I'm reading on Plato right now, so I definitely understand the need for making comments. What I'm doing now is underlining in the book and then making notes in a separate notebook. It gives me more space to pan out ideas or go back and go "Aha! That's what he meant!" later. So while my reactions might not be written in pen, anyone who's been in the room while I read can tell you my reactions are written for the world with laughter and snorts, sighs and tears, and many an irrepressible exclamation of dismay or excitement. But only in pencil, of course. I don't handle books with care in general. I write on them, I do horrible things with the binding, I lay them open on the couch. I feel a book is something that's meant to be used, and as long as it's yours, who cares what you do with it. The best thing about underlining and writing is that when you go back to read it, you often wonder, why? What did I like about that passage. I admit it, I am a purist, I don't write in books. If I feel the need for notes I use a post it. I also won't buy books that have been written in. I don't want anyone else influencing my reading pleasure! I was brought up to not write in books, not to bend down a corner and to always, always, always, open a new book "properly." 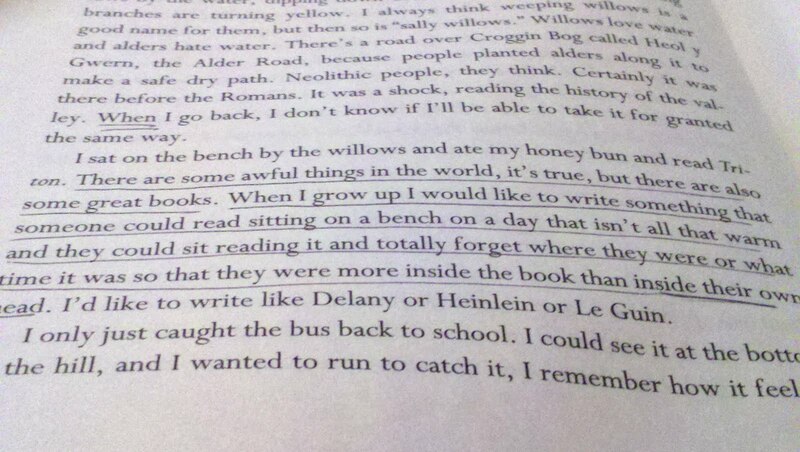 When I was first in college, it was difficult for me to underline, highlight or write notes in the margins of books. I did, however, overcome this and I now write in books - usually non-fiction - when something strikes my fancy. Making a note in the margin also helps me remember information. I very seldom write in fiction books - I am usually off in the world of the book and can't be bothered. I don't do it but I don't at all disdain those who do. I tried an experiment of writing in a book one time last summer, and it was okay, but I didn't feel like it added substantially to my reading experience. Meanwhile I felt very very guilty for writing in the book, and when I thought of writing in my other books, non-test books, I just couldn't bring myself to do it. I have to say the best part of this post is the shout out. Otherwise, I disagree with everything you stand for. In all seriousness though, having heard and read your position on the subject I find myself relenting a bit. It's still not something you'll ever find me doing but I can understand a little better how it can help someone enjoy a book more. And I will admit that it can be cool to read someone's thoughts about a book although I think that for me it would have to be a book I've already read as I'd find the notes too distracting. I'm one who also writes in books, particularly books I plan to re-read. It's great to go back years later and see what jumped out at me during my first reading. I also love getting used books with other people's marginalia and highlighting. It's drawn my attention to things I would have missed many times. The only exception is books that have some kind of value that I want to keep in excellent condition - first editions, signed books, etc. I don't write in my books but I actually enjoy used books that have writing in them. I wrote/highlighted textbooks but nothing else. It's one of the reasons I love my Kindle: I can annotate, underline as much as I want without actually writing in a book. I write in my books, too! For me, it's the highest sign of respect and love for a book that I want to revisit it and brand it with my feelings in some way. Softdrink - I think I'm as much drawn to the interaction as the history. Trish - I love how differently readers react to writing in books. Some are opposed because of the idea of marring a book's pages, but it doesn't seem like you fall into that trap - more that it removes what you call the neutrality. To me, that's the best part - seeing what I (or others) thought before me and marking how my current thoughts differ. Brenna - No problem - I loved your post! I'll write in whatever is on hand, but as I mentioned above, it has to be fine-tipped, otherwise it looks too blotchy to me. Plus the margins are too damn small! Kerry, I would disagree. I still remember many of the times I've laughed or cried during a particular poignant scene. It might not outlast me, but if you were to reference a scene from a book I reacted to, I would be able to tell you exactly how I reacted. Indeed it is the emotional reaction, not the written one, that leaves a footprint on my mind. I've written hundreds and thousands of footnotes and margin notes in textbooks, but I can't remember a single one. Yet I remember literally giggling with anticipation during the climactic battle scene of Jim Butcher's Changes, despite the fact that I read it a year ago. Or how I was puzzled and intrigued by the Bene Gesserit breeding programs in Dune, a series I read nearly 10 years ago. Robyn - I've definitely done that, gone back and looked at a passage and wondered what it was that stood out about it when I marked it the first time. Elisabeth - So strange! I don't find it distracting. I love seeing what other people are saying. Ann - I can understand that, but aren't there ever passages in a fiction that just resonate and want to be recalled? Jurgen - Glad I could sway your opinion, at least a little. We both know how much of a feat that is. Julie - I'm with you on first editions, valuable books, etc. Andi - That's how I feel: writing in my books is not disrespecting them, it is permanently marking how much I do. Books I dislike tend to have less markings (unless it's something like "WHO WRITES LIKE THAT!?" Hap - I agree, they might resonate more for you, but no one else that picks up your copy of the books will know which passages made you laugh, cry, scream, throw the book. Underlines and marginalia mark out those passages for whatever readers follow you.